What Is I Ching Hexagram 62 All About? Hexagram 62 yijing shows the importance of taking one step at a time to gain success. It takes smaller accomplishments to work up to a much larger achievement. Making a plan that has several milestones will help lead to the end goal. Now is the time to achieve success through smaller tasks instead of one big action. Most of the time, it is impossible to complete something in one swoop of effort. It takes time to accomplish greatness and it starts by making small accomplishments. 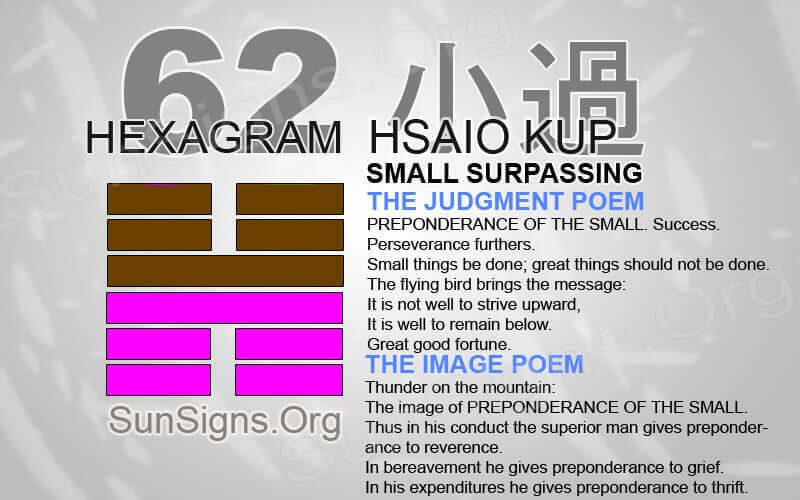 Hexagram 62 shows the importance of focusing on the small details instead of just the big picture. It is easy to become distracted by the larger things in life. Often our thoughts turn to what is happening later in the week. Or what you need to do before the day is over. Having a family meal around the dinner table might be a small action. But it has a great and lasting effect. Take ten minutes out of the day to meditate and clear the mind. It is the small actions throughout the day that can help maintain a healthy lifestyle. We can accomplish much. But we cannot if we are not willing to focus on the smaller aspects of life. If you want to create and produce a new product, where do you start? First comes the idea, then comes the first, second, and third revisions of the sample. This is followed by a prototype to show a company, and finally the finished product. I Ching 62 says there are steps you need to take to reach the end goal. But it should be noted that you have to complete the small parts first to reach the end. The idea did not first come followed by a business proposal. All aspects of success start with a well thought out plan that has steps to achieve. Small goals help complete a much larger goal. When strengthening a relationship, make sure to focus on the small details. We don’t need to show our affection by producing one major event. But we can do so by doing small things to show we care. A small bouquet can have more meaning than a piece of jewelry. Take time out in the day to talk with your partner and hear what they have to say. This can have a bigger effect than going out to an event. Focus on the smaller parts of a relationship such as communication. Do not worry about the direction in which the relationship is going. This will help you realize what is most important in life. A successful relationship comes from taking one step at a time. I Ching yijing 62 says perhaps, you are constantly worried about a deadline even though there are several days before the project is due. The point is, we fill our lives with multiple tasks. Then, we are then unable to see the smaller things in life. PREPONDERANCE OF THE SMALL. Success. Small things may be done; great things should not be done. It is well to remain below. The image of PREPONDERANCE OF THE SMALL. Thus in his conduct, the superior man gives preponderance to reverence. In bereavement, he gives preponderance to grief. In his expenditures he gives preponderance to thrift. Accomplishing small tasks first can often help keep the flow of encouragement pushing forward. Putting all of your time into one large task is not a good idea. Then, it is possible to lose interest in the project and want to start something different. Setting small milestones takes our focus away from the daunting distance between the start and beginning. This gives us small goals to complete. Slow and steady progress while focusing on the small details will make the journey feel less scary. Hexagram 62 says you can start to enjoy life once again.